The most common forms of Aflas® (100 or 150 series) are categorized within ASTM D 1418-01 as FEPM. These grades are alternating copolymers of tetrafluoroethylene and propylene, with a fluorine content of ~54. Such chemical structures offer excellent heat resistance, exceptional chemical resistance (significantly to alkalis and amines), along with high electrical resistivity. 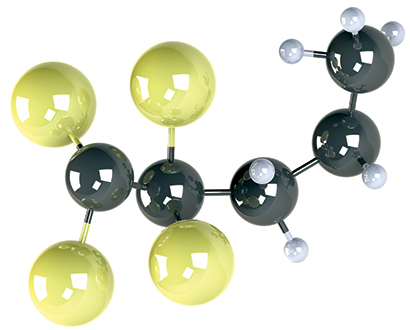 Aflas® rubber compounds are resistant to a wide range of chemicals such as acids, alkalis and steam (up to +170°C), offering superior resistance to strong bases in comparison with FKM. A common weakness of Aflas® compounds, however, is low temperature performance in aromatic oils and only limited resistance to mineral oils. Service temperatures are -5°C (25°F) to +200°C (+400°F). The AFLAS® 200 Series is a terpolymer composed of tetrafluoroethylene, propylene and vinylidene fluoride. The AFLAS® 200 Series offers a good balance of chemical resistance and improved low-temperature performance and is categorized in ASTM D 1418-01 as class FKM, type four. It is resistant to engine coolants with high level of rust inhibitors, extreme pressure (EP) gear lubricants, transmission and power steering fluids, highly resistant to automotive oils heavily formulated with amine additives and all types of brake fluids including DOT 3, mineral oil, and silicone oil.